Volatile organic compounds (VOCs) comprise a broad range of carbon-based chemicals, some of which are dangerous to human health and the environment. As a result, the growing interest in indoor air quality in the workplace is stimulating the development of measuring instruments for detecting VOC emissions in enclosed atmospheres, such as laboratories, semiconductor clean rooms,and production line environments. In general, quality measuring instruments must be able to receive a variety of sensor signals, and may even feature advanced functions for controlling related devices. The collection of accurate data and successful execution of controls is largely dependent on the instrument hardware. Multi-brand hardware products increase the complexity of system integration by necessitating time consuming compatibility testing, thereby delaying installation and implementation. 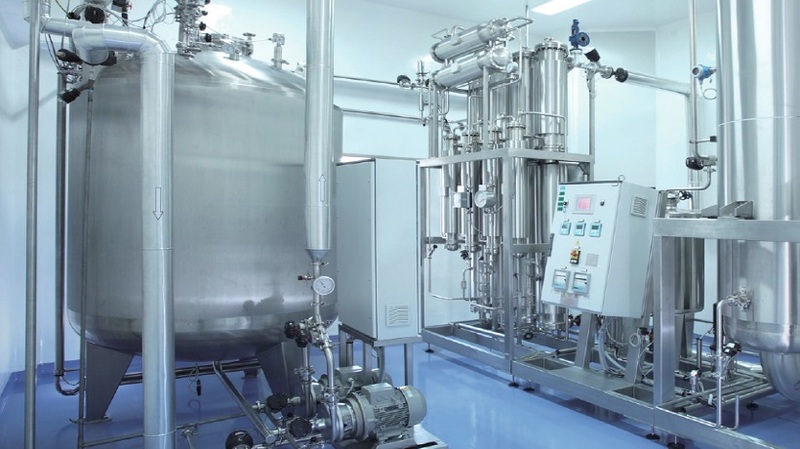 This client for this project was a Taiwanese supplier of measuring instruments and manufacturer of water quality monitoring equipment and VOC analyzers, whose products have been adopted by various industries, such as the public utilities, petrochemical, and semiconductor and electronics industries. The company’s existing VOC analyzers use hardware of multiple brands to measure temperature and concentrations of atmospheric gas. This “patchwork hardware” approach requires excessive cabinet space, hinders development and maintenance, and can be easily replicated by competitors. Therefore, the company wanted to upgrade the system with an all-in-one, industrial-grade solution. The all-in-one solution needed to comprise an industrial box PC and DAQ module. Because the company’s VOC analyzer is typically embedded in a cabinet computer with several other devices, the new hardware platform needed to be compact to fit limited spaces.Additionally, the solution required multiple I/O channels (both analog and digital) to accommodate numerous signal types. Finally, and most importantly, their system needed sufficient security to prevent the solution from being copied or imitated by competitors. Advantech’s MIC-1816 is an embedded computer equipped with DAQ module. The system’s compact, fanless design makes it ideal for limited-space installations. For this project, MIC-1816 was installed in a cabinet in order to connect the thermocouple, intake valve, valve button, and relay with LED indicator. This allows the VOC measuring system to be used for collecting sensor signals and controlling related devices to thereby regulate temperature and VOC concentrations. MIC-1816 is the industry’s first embedded DAQ platform. Although the device is compact (165 x 130 x 59 mm) and palm sized, it delivers sufficient computing power to satisfy the requirements of this project. The system’s high support for integration allows the company to replace the previous “patchwork” hardware with a single platform. Multifunction I/O (including analog inputs, analog outputs, digital inputs, and digital outputs) allows users to connect to multiple devices and manage various components. Moreover, the provision of 16-bit-resolution data acquisition increases the accuracy of measurements, and the detachable terminal block can be directly wired to sensors for easy installation and maintenance. Finally, to prevent piracy and protect the customer’s intellectual property, Advantech can embed MIC-1816 with a unique device ID that is stored in EEPROM. With this customization feature, available upon request, the MIC-1816 system will only function if the device ID matches that in the EEPROM. This is to prevent other manufacturers from copying the VOC measuring system’s functionalities, even if they use the same hardware components. System integrators or equipment manufacturers looking to develop an advanced solution for increasing business opportunities must select the appropriate hardware platform to successfully launch products while protecting their intellectual property assets. 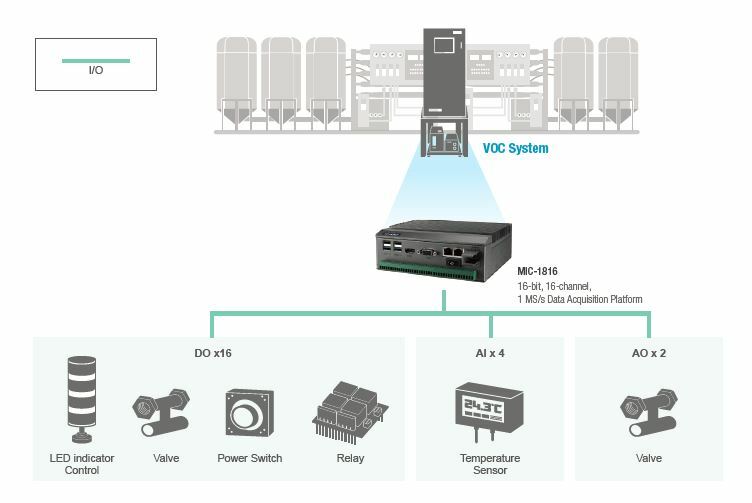 Compared with the company’s previous VOC analyzer solution, which comprised multiple differently branded I/O modules, Advantech’s MIC-1816 system isan all-in-one platform equipped with the required data acquisition and control functions. The platform supports integration, allowing system integrators and manufacturers to conveniently develop and maintain the system. Moreover, the provision of a unique device ID as an encryption mechanism prevents third parties from replicating the platform. Currently, the new VOC measuring system has entered the trial production phase. Thus far, the company is very satisfied with MIC-1816 and plans to continue developing the platform features and functions.